Eat. Live. Laugh. and sometimes shop! : Weekend Words of Wisdom. But I have to say, it is weeks like this when I yearn to call my Dad and hear his gentle voice. I know if we could talk, for even five minutes, his words would perfectly comfort and encourage me. I need his words of wisdom. I need his calming presence in my life. 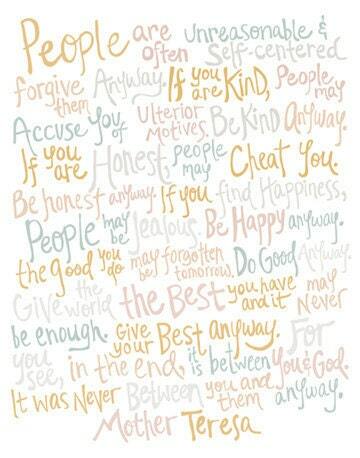 In lieu of my Dad's words, I found these words attributed to Mother Teresa. I suppose it's not such a shabby Plan B. If you have not already entered, do not miss the opportunity to win a gorgeous 100% silk charmeuse poncho by Lesley Evers! The giveaway closes today -- Thursday, April 5th.